A long time ago in a galaxy far far away… you know the line. But let’s all admit it. We’ve read our share of bad prologues. Especially in sci-fi and fantasy, prologues get abused — a lot. Show of hands: How many of you skip prologues without actually reading them? I thought so. And it seems the publishing industry is over prologues. Most agents and editors nowadays will tell you to cut that prologue right out of your WIP. Or worse, they won’t even look at a manuscript if it has a prologue. Still, just because prologues get abused and overused so much, doesn’t mean they’re worthless. Before I get to defending them, though, let’s go over a couple of things a prologue is NOT. a place to store irrelevant back story and force it on your readers. In most cases, novels don’t need prologues. The information they contain can usually be dispersed throughout the first chapter without breaking the flow of the narrative. But occasionally prologues are the perfect place to showcase a piece of necessary information, or a voice that would otherwise not be included. The prologue to Patrick Rothfuss’s The Name of the Wind, for example, gives us a wider, more omniscient view of the character Kote. Without spilling all the beans at once Rothfuss sets the tone for the novel and for how we should view his main character, a detail that is very important to the telling of the story. 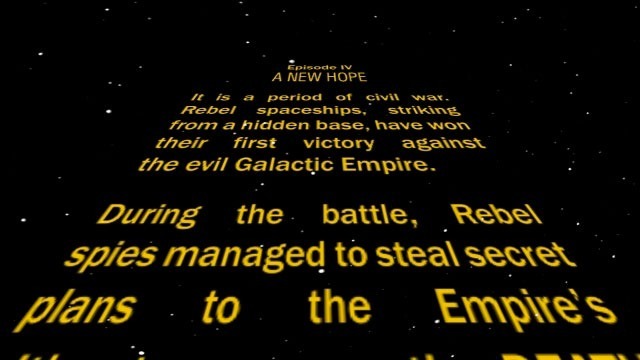 Star Wars is the perfect example of a prologue being put to good use. At the time that the movies released, science fiction was a relatively unfamiliar genre for the general public. The prologue, therefore, was crucial in setting the overall tone, outlining the basic rules of the universe, and orienting people with the main conflicts that the characters will face. When well done, a prologue draws us into the story. It cracks the lid on all the juicy awesomeness that’s yet to come, calls to our curiosity, and whets our appetites for adventure.